Eight of us converged on Modo Mio Restaurant last night for an early pre-theatre dinner (we had tickets for The Lion King at the Academy of Music, sorry, that’s neither in the Wine or Dine category so you get no review). This was the second time in less than 2 months for my wife, Kathy and I and, as usually happens, it’s often difficult to repeat a great performance. That’s not to say we didn’t enjoy our meal, as we certainly did. The food at Modo Mio is unique and wonderful. It just didn’t totally click like it did the last time we were here. It may have been that, at our early 5:00 P.M. reservation, there was also a party of at least 30 people, who had arrived just before us, and that may have put an added burden on Chef Peter McAndrews kitchen. The wines were very good. Gerry C. had the wine of the night with his bottle of 2003 Jean Louis Vermeil, Cabernet Sauvignon. I brought with me the 2006, Proprieto Sperino, Uvaggio, this is the work of Italian winemaker, Paolo de Marchi and his son, Luca, who resurrected a long dead vineyard in Piedmonte at the base of the Alps for this soft and supple wine. Joe B. had his new, favorite wine, the 2006 Luigi Bosca, Single Vineyard, Malbec. Tom and Barbara T. who have joined us for the first time in a few months, had the 2008 Tanguero, Malbec, Mendoza. 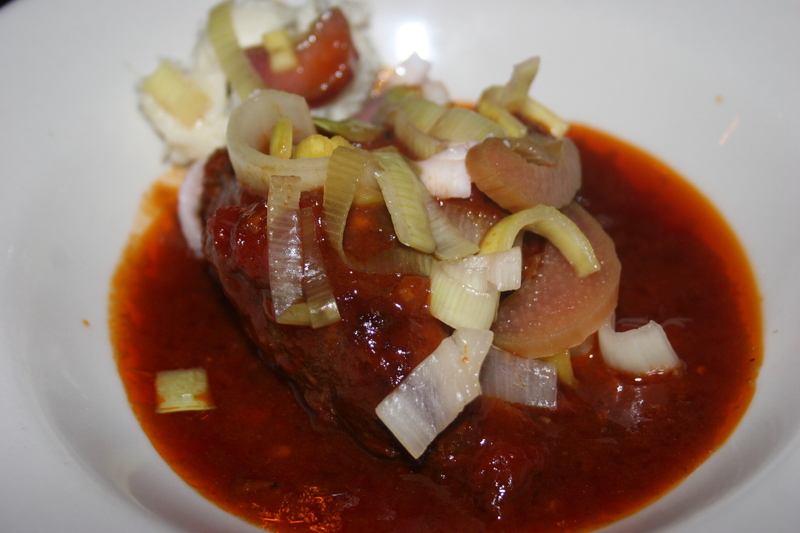 We again all chose the “Tourista” menu offering 4 courses for $33.00. We started with appetizers, and although I can’t recall what everyone had, I will do my best to mention the ones I do remember. 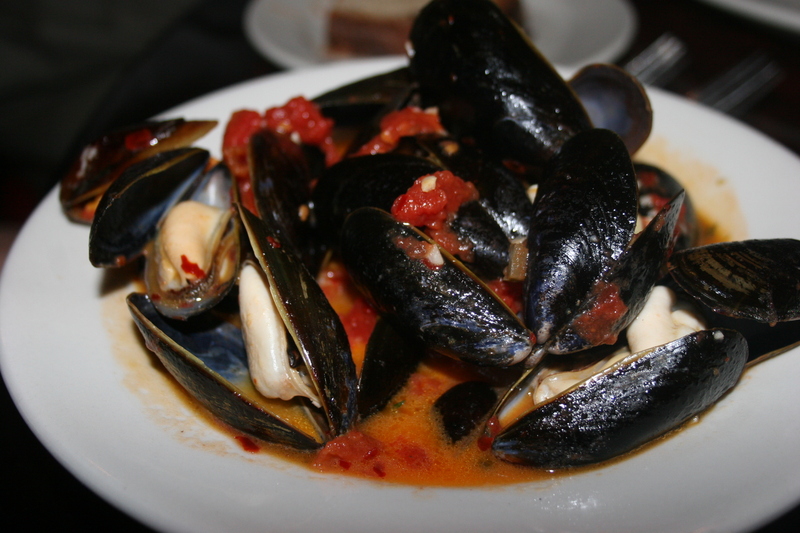 I know Jerry C. had the mussels in a spicy red sauce while my wife, Kathy, had the mussels in a white lemon butter sauce. Although, as I have mentioned numerous times here, I am not a mussels fan, I did dip some bread into Jerry’s and Kathy’s sauce and would have to declare Jerry’s as being more flavorful. 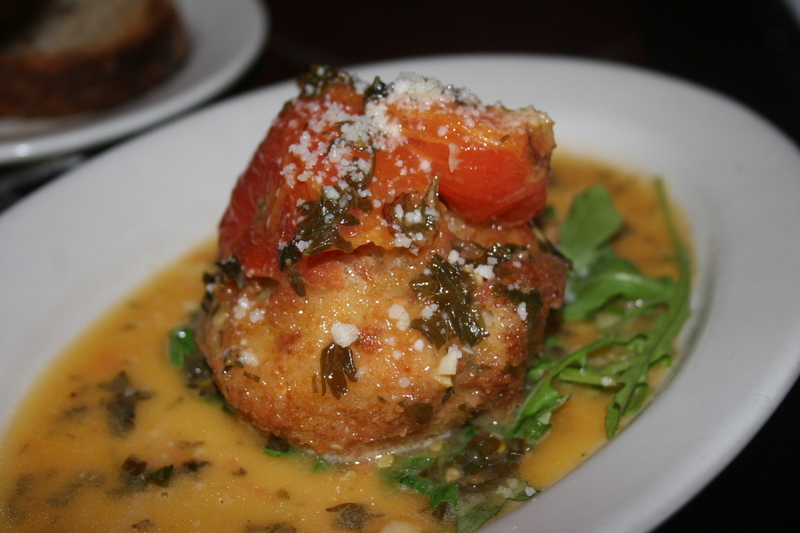 Joe ordered the Carciofi al Mattone, smoky artichoke, smoked mozzarella, roasted tomato and lemon butter. 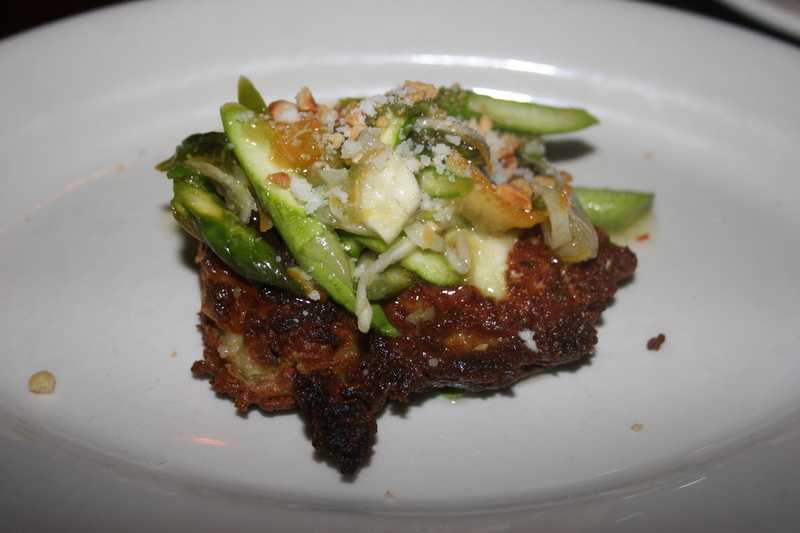 I went with the Sformato (ya gotta love these names), crab and ricotta cake, hazelnuts and asparagus. Joe enjoyed his. I loved mine. 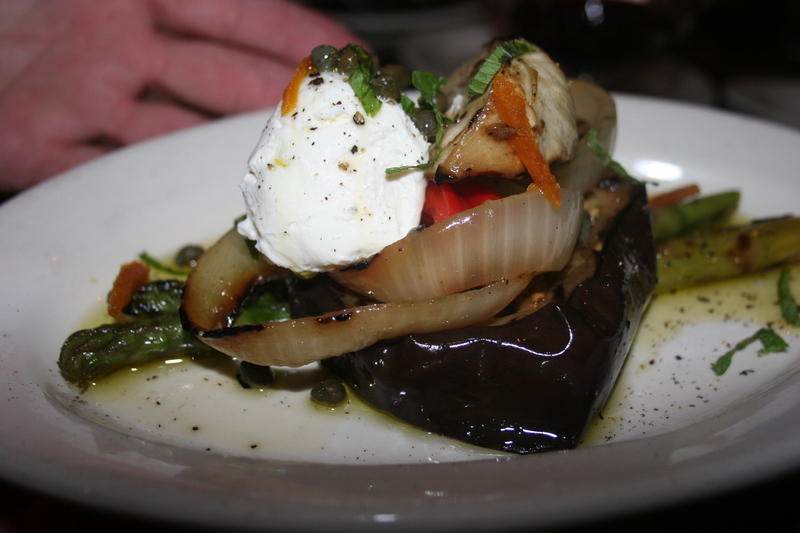 Sue selected the Verdure Grigliata, grilled seasonal vegetables, capers, shaved bottargga and new olive oil (I hate when they use the old olive oil). It looked good but just a tad too healthy looking for my taste. Before I move on to the pasta dishes I would be remiss in not mentioning that Danielle, our server, did a great job all night long in describing each dish, assisting with entree selections and simply being a good-natured, high energy professional who obviously took pride in her job. We sometimes forget that those who serve us add a great deal to the ambiance of the meal. Thank you, Danielle. We all thought you did a great job! 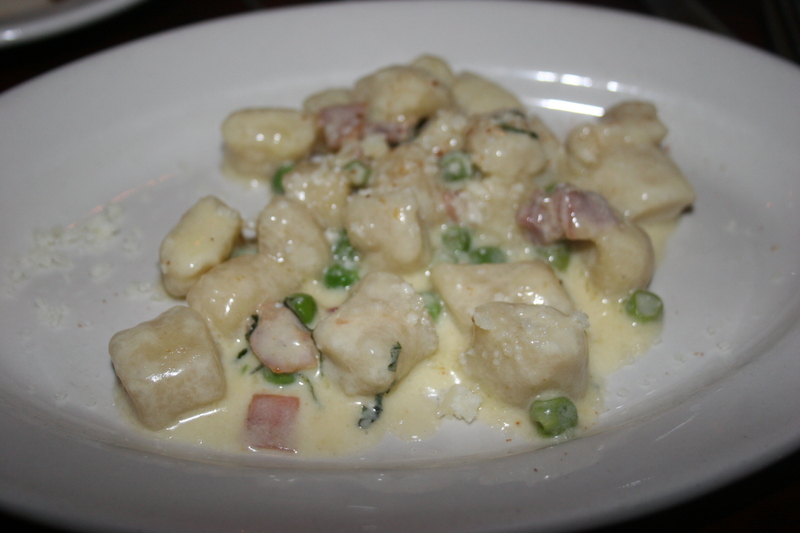 For his pasta dish, Joe B. ordered the Gnocchi, potato dumplings, prosciutta, peas and cream. I had a taste of this dish and although it was very good it fell shy of the potato gnocchi at Blackbird in Collingswood. That one was in a league of its own. 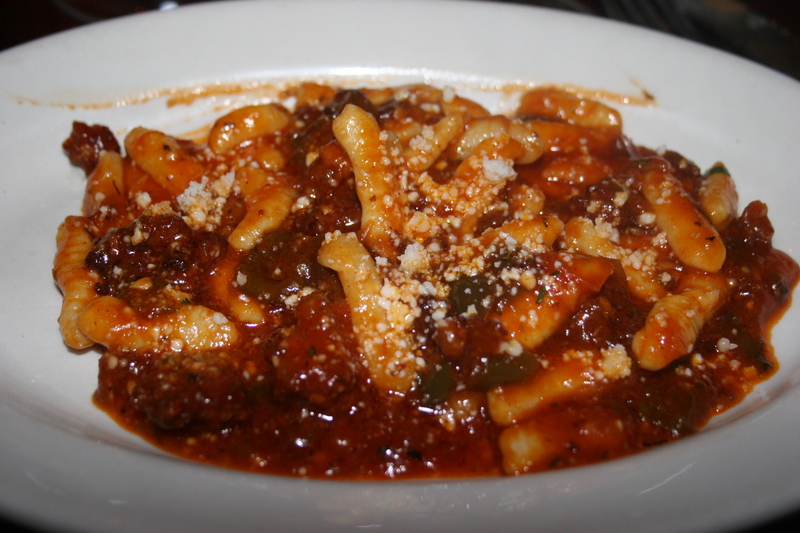 I had the Malloreddus, chewy Sardinian pasta, sweet sausage and red pepper ragu. I really liked this dish. 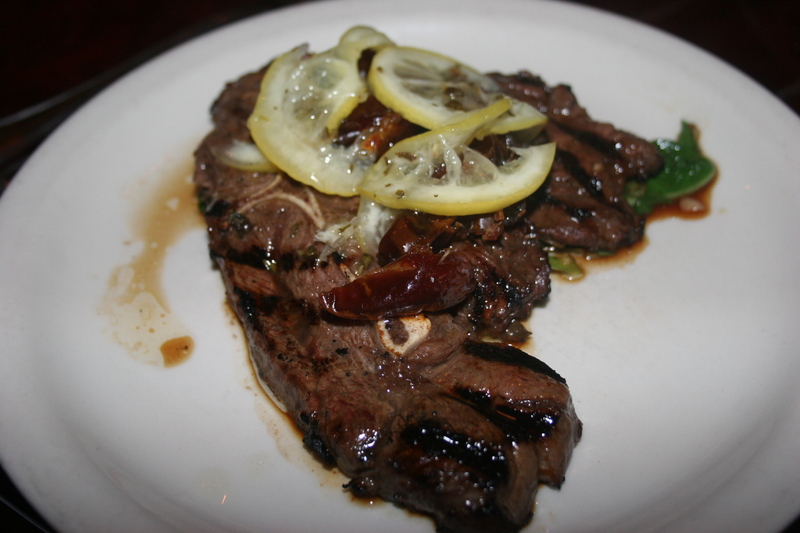 It was tangy and flavorful and just the right food to serve as a link to my entree. The portions here are just right so that you leave feeling well-fed without that bloated feeling. 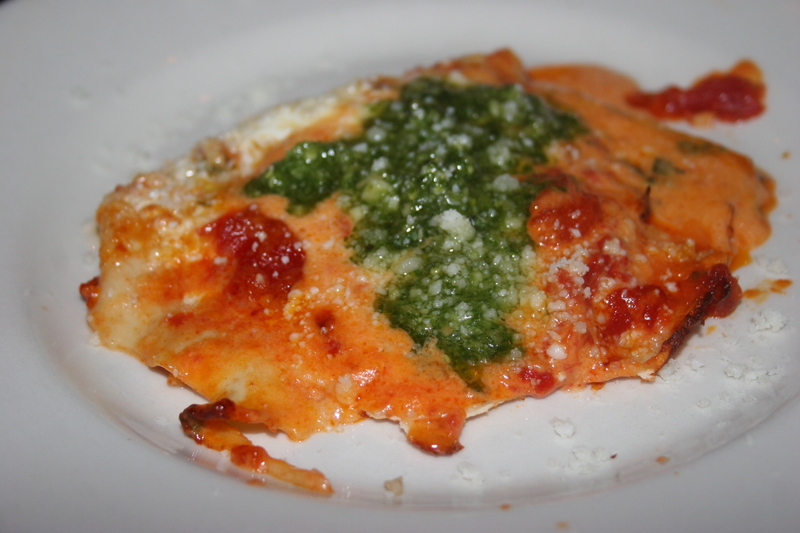 Jerry C. chose the Lasagnette, tarro lasagna, basil pesto, buratta and plum tomato, I was a little concerned that his dish didn’t look like lasagna but then I was reminded it wasn’t supposed to because it was Lasagnette. It was different and Jerry enjoyed it. Now it was time for the entree and we had all put a lot of thought into our selections. Both Joe and Carol B. were talked into the Veal Cheeks. Danielle was nice enough to clarify that the “cheeks” in question were located a fair distance south of the face. 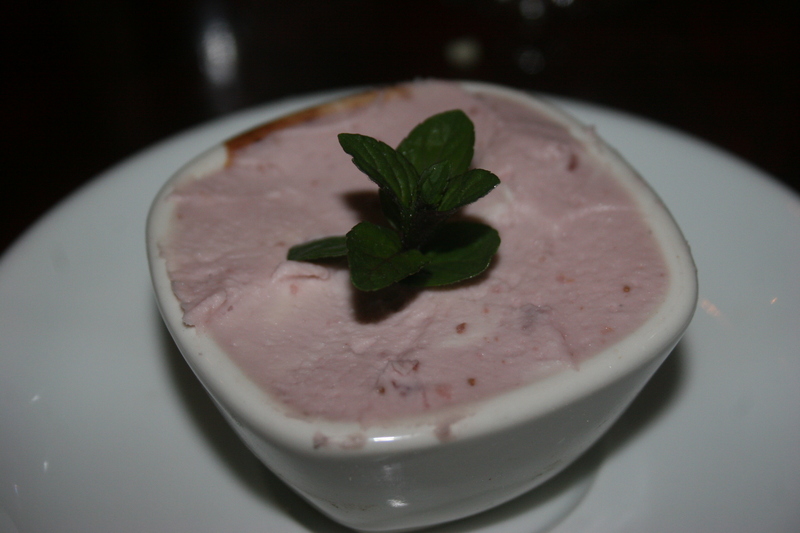 This item is offered often on the Modo Mio menu and prepared differently each time. The menu asks that you simply trust the chef. My wife, Kathy had this on our last visit and really enjoyed it. Carol and Joe found it less than what they had hoped. The cheese was too overpowering for the meat and Joe found the meat to be of a texture that was not what he had expected. 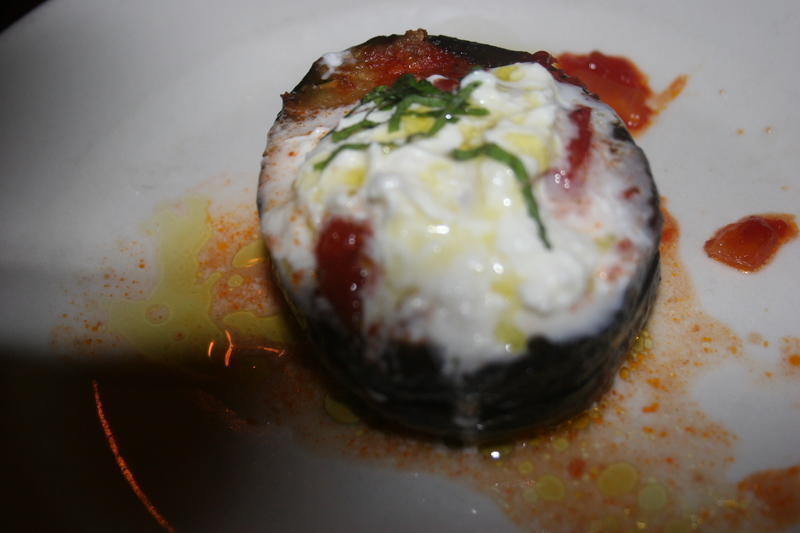 Sue C. had the Melanzana Ripeina (which, to me, sounds way better than saying “eggplant”), tomato braised stuffed eggplant, Molise style ( I almost wanna look that word up), mint and house-made ricotta. I think they both enjoyed their entree. Jerry made his choice from the “specials” menu and although I do not recall how it was prepared, I do remember it was Lamb Shoulder and that he had it medium rare. Jerry is an avid hunter and I’m sure he has gunned down a few lambs in his day but this was probably the first time he had the shoulder of lamb. He thought it was very good. I believe it was Barbara T. who had this unusual looking dish as her entree. It’s the Brook Trout but I don’t believe it was prepared as listed on the menu and I vaguely recall Danielle explaining the evening’s preparation. I think I see strawberries on the plate. 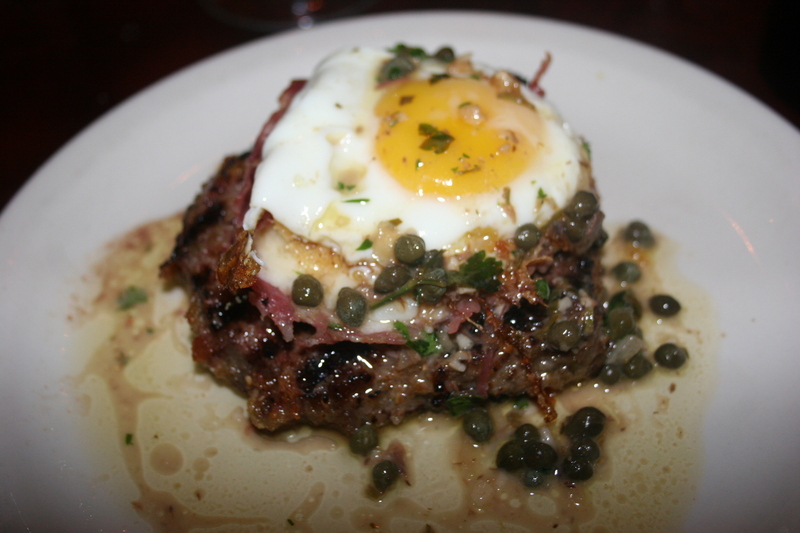 Kathy had the Bistecca Siciliana, breaded grilled rib-eye, aged provolone, fried egg, lemon anchovy butter. Personally, I could not get past the fried egg sitting on top of the meat. That is such a total no-no to me unless it’s 10:00 AM and I am having breakfast. Fortunately, much of the world does NOT share my opinion and Kathy thought her rib-eye was excellent. My entree was very unusual. 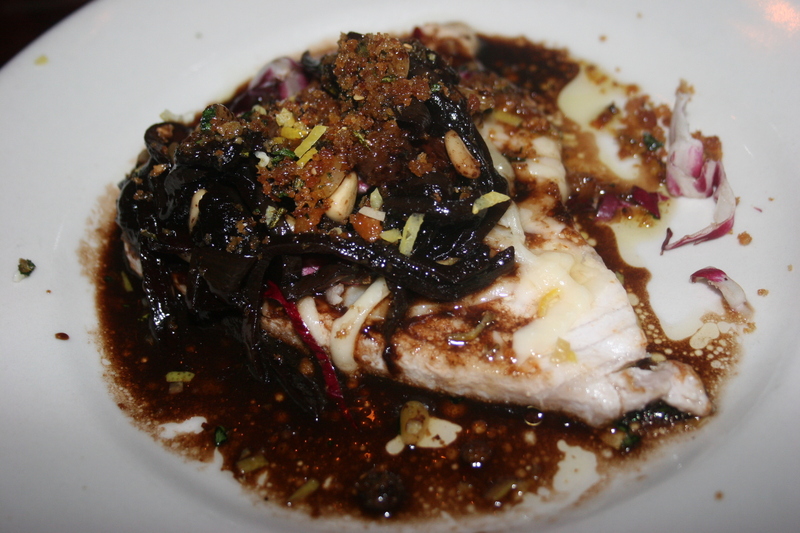 Pesce Spada was a grilled swordfish, balsamic braised onion, golden raisins, pine nuts, radicchio, smoked mozarella, rosemary pangratugiatto. 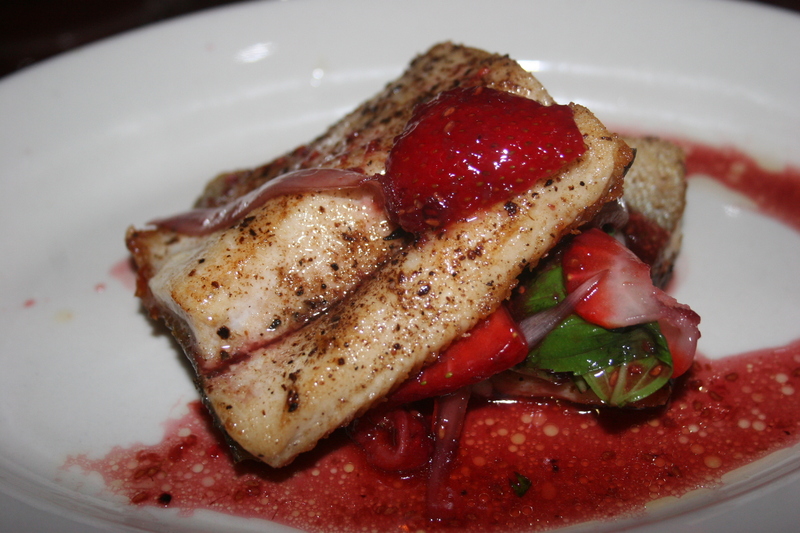 It was such a unique combination of flavors that it almost drowned out the swordfish but not quite and I really enjoyed each bite as the tangy balsamic flavors mingled with the others to create a really different taste experience. For dessert Carol had the Deconstructed Cannoli while the rest of us who obviously had no mind of our own, all chose something that featured a deep, dark, absolutely scrumptious chocolate mousse topped with a berry whipped cream. My only complaint on this dish was that it should have been four or five times larger as it disappeared quickly while the sweet memories lingered on. I’m using the smaller picture because without being able to see that yummy, dark chocolate under the berry creme topping there is little to validate my praise of this dessert. 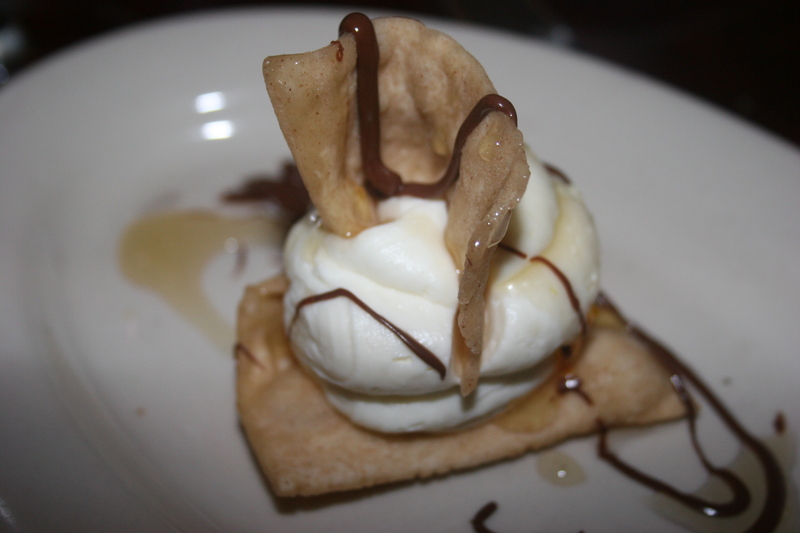 Chef McAndrews did stop out to say hello and bring us the complimentary shots of Sambuca. He was having a busy day and as I mentioned earlier. This was not on a par with the first visit but it’s still a great place that I would return to often. 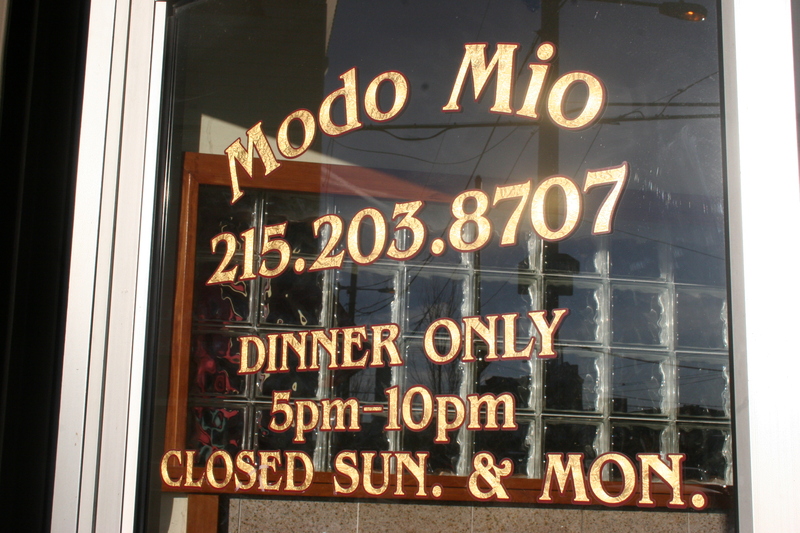 Modo Mio serves a no-menu Sunday Dinner that replicates an authentic Italian family dinner. These Sugi Sundays are priced at $33.00. It would certainly be worth a drive to this Brewerytown restaurant, located at 151 W. Girard Ave., to give it a try.